We are delighted to announce the release of our PoshC2 Python Server, allowing cross-platform support. The Python code enhances the flexibility of PoshC2. One of the main features is cross-platform support, therefore the server will run on both Windows and Unix based systems. The main feature of running the server on Linux is to enhance the team collaboration piece, which has always been limited via a Windows system. The Python server can be installed as a service; see the ‘Systemctl Service’ section below for more details on how to achieve this. It also allows multiple users to connect remotely and run their own implant handler to interact with each implant, while viewing the output from journalctl. Alternatively, the server session can be run from a screen terminal and multiple users can view the same screen session. The best results would be to run this as a systemctl service so it survives a reboot and will automatically re-start. Almost all features have been ported over to Python from the server side, apart from the compiled executables that were ordinarily generated using .NET’s command line compiler csc.exe. However, instead of generating .NET binaries, we have introduced new template files that are written in C++ that can be modified and used as a template. See the ‘Templates’ section below for more information. This gives the user the ability to modify the template files, customize the binary, change the process the shellcode is injected into, the injection method, hardcode a domain name or any other additional functionality you can think of to enrich the dropper. This is an example of the C2 server up and running. Similarly to PoshC2, the server window is usually viewed side by side to the Implant Handler to maintain consistency. The server will populate all the payloads only the fly, including the one liners, shellcode, HTA and macro files. The PoshC2 server can now automatically be started as a service using systemctl within Linux. You can choose to either have this functionality enabled or not during the install; by default the service is not created, but it can be enabled by following the steps below. The advantages of having the C2 server installed as a service are endless, but most importantly if you are on a live engagement and the server for some reason fails or reboots, your C2 server will be resilient and bounce back once the system is back up and running. Once the file is in the correct location, the systemctl command will know how to enable the service, should you require this. To enable the service, run the enable command, followed by start, as shown below. You can also stop or restart the service if you need to change the config or re-run the server for any reason. The best feature of running PoshC2’s python server as a service is the fact you can view the server output using the journalctl log. If you are running the server on an engagement with multiple users, it is very easy to share the output by running this command when you login via SSH. While this hasn’t changed significantly since the first iteration of PoshC2, it’s one of the most important elements of the tool. It will fundamentally assist in the SOC detection and response phase of your engagements, i.e. when assessing the response of the Blue Team. It is, of course, also a professional requirement to have full logs of offensive activity. One addition to the reporting section is the introduction of the opsec command which is in the pre-implant help. This will provide a list of all files uploaded to the system, including a unique list of hosts touched for reporting purposes. The output-to-html now uses a GraphViz implementation which is still a work in progress, but aims to visually represent the compromise in action, including all hosts that are connected to the C2 server and how they are communicating back to the infrastructure. 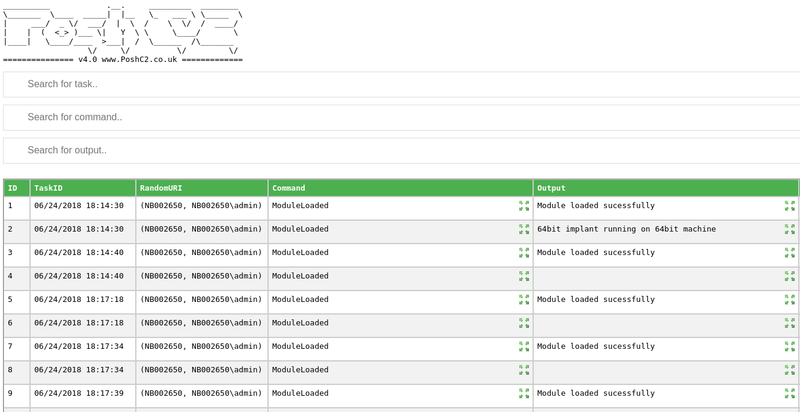 For example, if you have a host daisy chaining via an implant this will be displayed on the GraphViz output below. These files are generated when the output-to-html function is run within the pre-implant handler window. All icons are customizable via the output file that is generated or you can switch these out editing the files folder in PoshC2. Videos will be released shortly on how to get started with PoshC2, including customizing the Config.py file and editing the source files for better optimization. To get started, follow the instructions on the readthedocs webpage, which walk you through how to customize your install and have a better chance of not being detected within your engagement. If you have any issues regarding crypto, this could be due to a dependency installation failure. The best way to get around this has been to create a virtualenv in Python and then install the requirements file manually for that virtualenv. For more information, read how to create a virtualenv in Python online. But what about SharpSocks? Never fear, SharpSocks works with Wine! If you need to find out how to get Wine installed for SharpSocks, there is a file called Install_SOCKS that has step-by-step instructions on how to achieve this. For those who don’t know what SharpSocks is, the following blog post discusses our release of a SOCKS server for PoshC2in detail. As previously mentioned, PoshC2 now has template files that can be optimized prior to starting the service. An example of why you might want to do this is environment detections such as domain name or user. The template files are created using C++; by default there is an executable that creates a file which migrates automatically, and one that stays in the same process. To reduce the likelihood of the binary files being detected, you could also sign the executables that are generated from PoshC2 by using a code signing certificate. This will add some legitimacy to the binary when calling out to the internet. As part of the initial payload, the PowerShell script will attempt to execute. 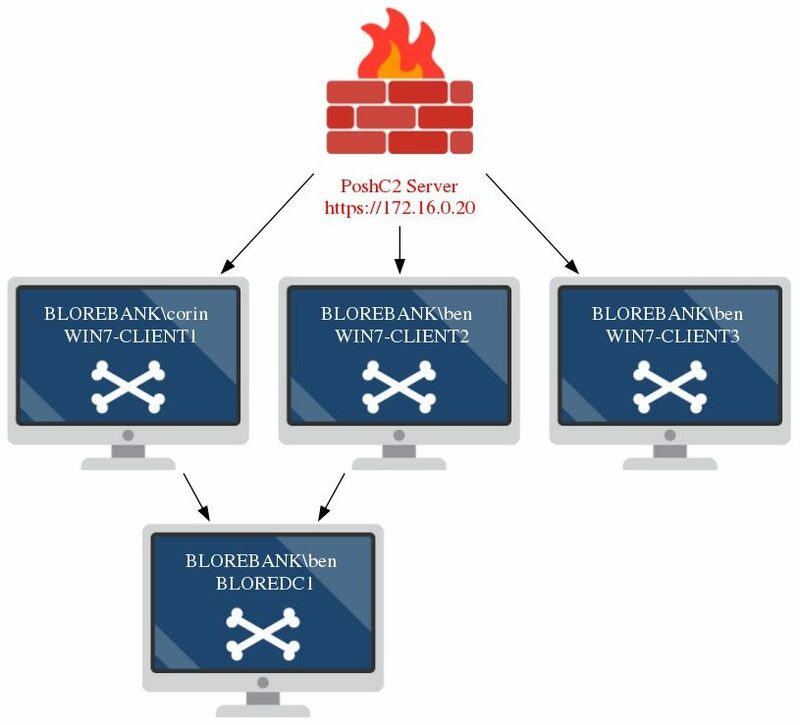 If the C2 Proxy or implant cannot reach the server, the process will wait for 300 seconds (5 minutes) and retry. If required, it will then wait for 600 seconds (10 minutes) and try one final time. This has been implemented as a backup in case your C2 infrastructure is locked down too securely and for some reason doesn’t accept the implant first time. This could be due to a number of environmental detections, including the external IP address. The implant could have passed the domain check but come from a non-whitelisted IP address. This will give you the opportunity to evaluate the IP address and add to the whitelist if this should have been part of the organisations external IP address range given to you. This can all be modified if the timings need to be increased for any reason; all of this code is in the Payloads.py file. Autoruns have always been a great feature for us. There is nothing worse than having to tell the C2 tool to load the following PowerShell module before running the command when this can all be coded into the tool. PoshC2 has implemented a lot of these by default, but if you want to customize them you can amend the autoloads by editing the AutoLoads.py file and adding extra lines. As you will notice, we have made a small start on the Python dropper to allow for Unix support. This has not been exhaustively tested, however, it is a start at making it possible to support execution on the likes of a macOS based system or similar. There is currently a requirement to have pycrypto on the box that is executing the payload but we are working on solutions to implement the crypto piece without requiring this dependency. Something along the lines of in memory module imports, or similar. If anyone would like to contribute to this side of the PoshC2, please don’t hesitate to get in touch. A Python implant has limited features right now. Currently you can set the beacon timer and execute commands on the host. When you start PoshC2 ,you have to optimize the Config.py file which will provide you a list of default URLs that can be used. These are publicly available and will most likely get signatured in time. To ensure you are providing the best chance of remaining undetected, you should optimize these URLs. This also goes for the UserAgent string. Prior to sending in any payloads, it is necessary to do reconnaissance against a target. This will often include techniques like web bugs or similar. 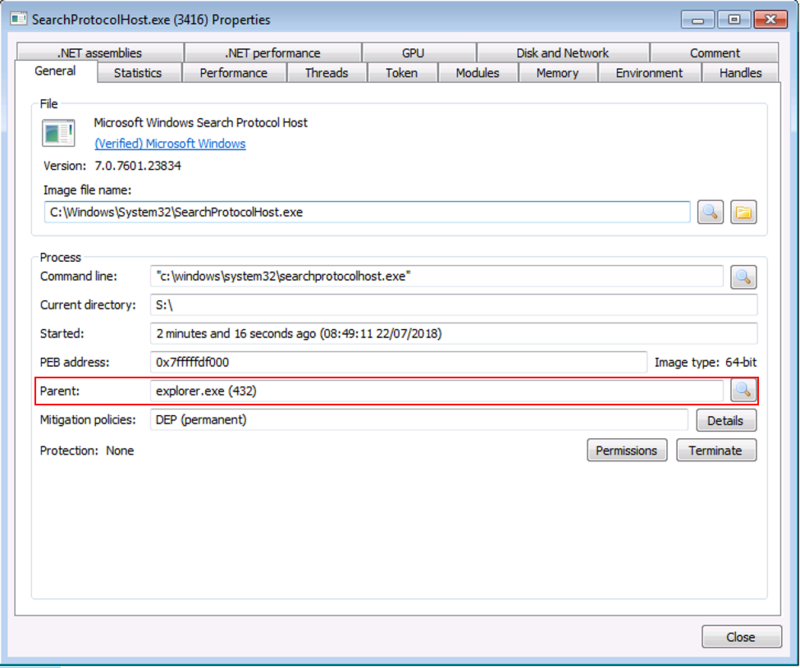 This will give you a change to identify the default UserAgent for the target estate. This could range from IE11, Chrome, Firefox or even Edge. You should re-configure the UserAgent configuration to be in line with the corporate estate to merge into normal business traffic on the proxy. Frameworks such as Cobalt Strike and Metasploit also have common indicators of comprise (IoC), such as ‘notepad.exe’ for Metasploit and ‘rundll32.exe’ for Cobalt Strike. 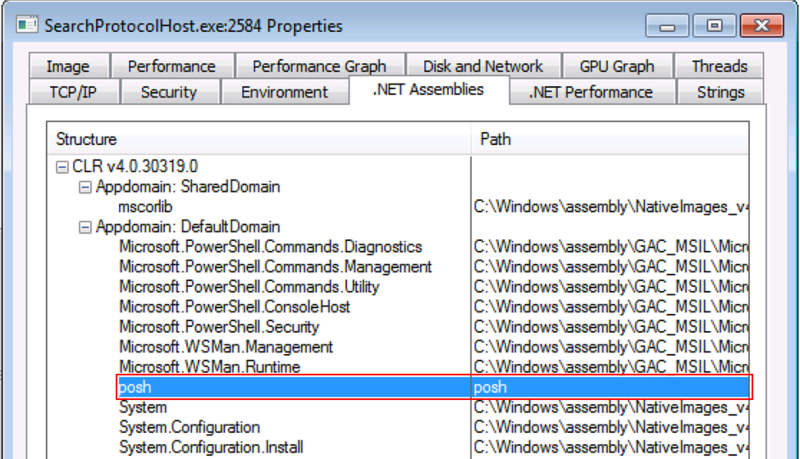 PoshC2 has a similar default process that is used for migration; this is netsh.exe. When performing the default migration within PoshC2, e.g. running the ‘migrate’ command, it will always start the process netsh.exe unless directed by the user on the command line. It is highly recommended that you customize this option; the new PoshC2 ‘Inject-Shellcode’ or ‘migrate’ function also has the ability to spoof the parentpid. Note, this works on Windows 7 but has had some failures on Windows 10. 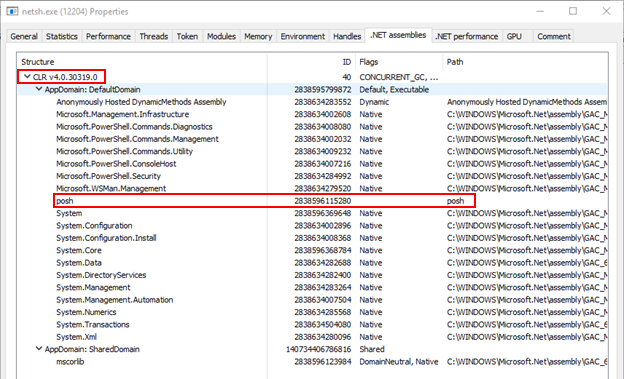 Also, the default method for process migration was using the win32 API call ‘CreateRemoteThread’. PoshC2 now has the ability to use ‘RtlCreateUserThread’ which is not quite as widely used across C2 frameworks. This was largely due to the help from @uint_ptr, who is our in house Windows wizard! From a logging and monitoring perspective, it is always good practice to migrate to a process that is expected to go out to the internet, e.g. Internet Explorer, Outlook, Lync or similar. If the client has an endpoint product that tracks process migration and history, going from netsh.exe out to the internet should be suspicious. Keep this is mind when selecting the process to migrate into. Here is an example of parent process spoofing in Windows 7. The following command was ran to migrate the process searchprotocolhost.exe and set the parentid of explorer (pid: 432). Note, this was all done using a standard user account. Persistence is also another function that should be completely optimized. PoshC2 has some default persistence methods, however, these are likely to be highly signatured and should be changed accordingly. There are many methods of persistence you can use, depending on your privileges. COM Hijacking is highly recommended or WMI if elevated. DLL Hijacking is also fairly difficult to detect; if you want to create a custom DLL that can be used for DLL hijacking, here is a simple code snippet that can be used to launch another process when the DLL is attached, which is perfect for DLL hijacking. A new feature we’ve added is an Anti-Malware Scan Interface (AMSI) checker. We have baked this into the core-implant module. This does a quick process check using PowerShell and determines if the amsi.dll is loaded into the core implant. If this module is loaded, it will notify you through the C2Server response and provide a way of unhooking this DLL. The way we unhook this module is using the work Adam Chester (@_xpn_) put together on exploring PowerShell AMSI and logging evasion. The way this function works is by using C# to pinvoke various Win32 API calls to identify where a certain DLL is loaded and its export functions reside in memory. As we own the memory for our process, we can simply overwrite the code in memory, returning the same response as if the malware check was benign. For visibility, it is possible to identify if PoshC2 is running in another process by using Process Explorer which comes as part of the sysinternals suite (https://docs.microsoft.com/en-us/sysinternals/). 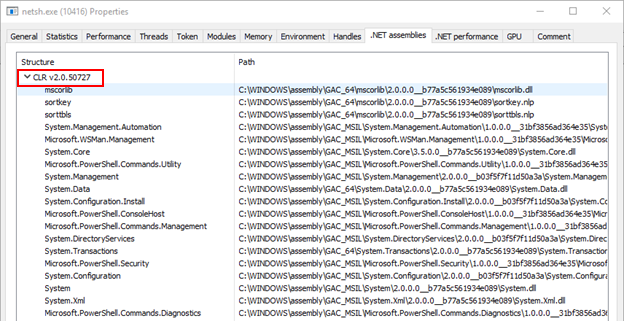 This allows you to see if any .NET assemblies have been loaded into the running process. If the process is in fact PoshC2, there is a known Indicator of Compromise when running the CLR v4.0.30319 because you will see a DLL loaded called ‘posh’. This does not appear in .NET version two, as shown in the examples below. In the not too distant future, this will be ported over to Python v3. Currently it’s only designed to work in version 2.7. In conclusion, both the traditional Windows PoshC2 and the Python Server PoshC2 repositories will be actively maintained by various contributors. We encourage you to use it, provide feedback and generally contribute to the project. You can always grab the latest version from GitHub.